Love, love, love this paper! For those of you unfamiliar with kraft, it’s known as a more casual paper, but as of late has risen to more semi-formal occasions. It’s typically a brown, natural-looking paper with little darker flecks in it. Kraft can be bleached to be (almost) white, but the most popular form is brown. Prepare to be amazed by what you’re about to see. Really. You’ll see how the casual nature of kraft is transformed to be something completely different. Kraft can be so versatile: from cutesy and informal to natural and elegant. There is one way to dress up kraft that we absolutely love here at Ann Elizabeth… and that is lace. Lace is (in our humble opinion) such a gorgeous way to “pretty up” the comfort of kraft. See for yourself in our inspiration board below! 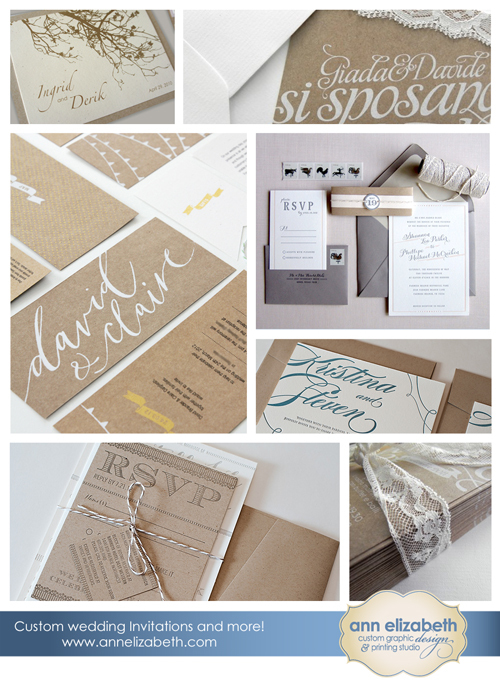 Whether kraft is the star of your wedding invitation ensemble or if there’s simply a kiss of kraft, it’s sure to be a success. That’s all for today- thanks for stopping by. Don’t forget to share this inspiration board with your friends! Tweet it, Pin it, Facebook it.